1. Put the pumpkin seeds in a large, dry frying pan and toast for 2–3 minutes over a medium-low heat, tossing the pan occasionally, until starting to colour. Remove from the pan and set aside. 2. Heat the oil in the pan over a medium heat and fry the mushrooms until tender. Add the kale, turning regularly until wilted, then add the butter beans, garlic, tomatoes and thyme. Cook, stirring regularly, until the tomatoes have softened. 3. Stir in the lemon juice and mustard, season, and heat through. 4. 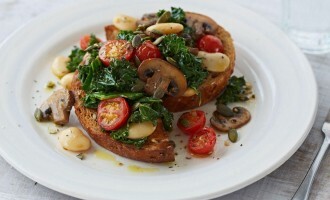 Spoon the bean mixture onto toasted bread, then sprinkle with the pumpkin seeds before serving.